Central Asia was the largest Muslim-majority region to experience Soviet rule during the twentieth century, along with the North Caucasus and the Volga-Ural regions. The Soviet Union sought to modernize this region and present it as an example of what Soviet socialism could bring to the Islamic world as well as to developing countries more broadly. However, the region maintained a tenuous balance between its Muslim cultural heritage and Soviet atheist modernism throughout the 20th century. 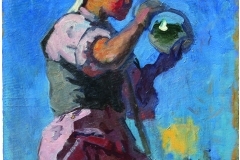 This tenuous balance is particularly apparent in the region’s Socialist Realism art, which was supported by the state, but often inspired by local cultural traditions. Furthermore, the region’s distance from the administrative center of the Soviet Union frequently allowed its artistic community to experiment with styles and themes with less scrutiny from the state than experienced by those in the European regions of the USSR. The result was a unique school of art that combined the monumentalism of Soviet art with Orientalist exoticism, local cultural influences, and parochial nationalism—a style of Socialist Realism that was distinctly both Soviet and Central Asian. Under Soviet political rule, artists across Central Asia created images that both embraced modernity and idealized the past. This exhibition examined the socialist realist art movement in Kyrgyzstan, Uzbekistan, and others areas of Central Asia, pairing twentieth-century paintings with examples of the traditional textiles they depict. Organized in partnership with GW’s Central Asia Program. Socialist Realism was a synthesis of artistic styles from late nineteenth century European realism with the doctrine of Marxism-Leninism. The Bolshevik revolution sought to transform the former Tsarist Empire into Marx’s utopian vision of an egalitarian society devoid of exploitation. This aspiration required transforming all aspects of society, including art. The new Soviet state declared that art should describe life in its everyday realities, be accessible to the masses, and project utopian visions of a bright, communist future for humanity. The result was Socialist Realism—the principal art movement of the USSR. This art movement has been well researched and has been highlighted in many art exhibitions. 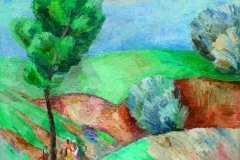 However, the primary focus of art historians and galleries to date has been on the movement’s manifestations in Russia. Socialist Realism’s history in the Soviet “colonial” periphery has remained largely unknown until now. Central Asian Socialist Realism celebrates the New World Order that the Soviets sought to create and reproduces its classic themes (industrial modernization, women’s liberation, urbanization, literacy, etc. ), and proletarian heroes (the teacher, the worker, the progressive farmer, the party leader, etc.). On the other hand, the art, whether authored by native or non-native Central Asians, maintains a certain Orientalist tradition, reminiscent of European colonial art, by romanticizing landscapes and faces as well as by using motifs drawn from local textiles and cultural traditions. The rising indigenization of the Republics’ populations reinforced a broader degree of autonomy in the cultural and religious realms and even cultivated a nascent nationalism. While the European part of the Soviet Union experienced some demographic decline, the improvement of sanitary conditions combined with high birth rates led to strong growth among the Central Asian populations. The rising indigenization of the Republics’ populations reinforced a broader degree of autonomy in the cultural and religious realms and even cultivated a nascent nationalism. The leaders of Soviet Islam played an ambiguous game, taking advantage of loopholes in the system to assure their own autonomy. In the arts, Socialist Realism was partially abandoned for new approaches. 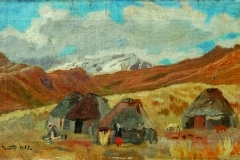 Symbols of traditional Soviet modernity began to disappear, and art was no longer commanded to represent “life as it is.” A certain Romanticism for landscapes and scenery emerged, and nostalgia for a lost world, a pre-industrial past, became a common thread connecting a new generation of Central Asian artists, especially those from indigenous ethnic groups. These new references to national motifs were transformed through more abstract interpretations of colors, textures, and faces. 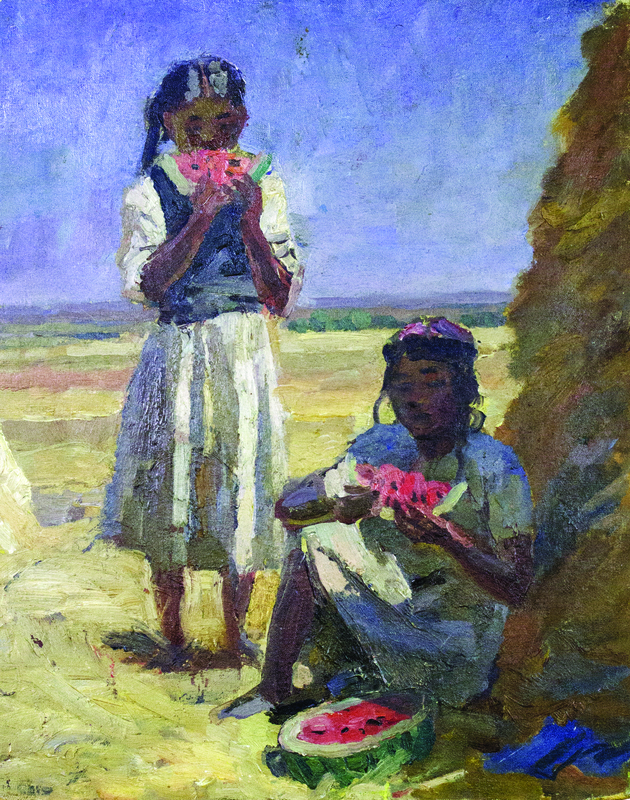 Thus, while reverence and nostalgia for pre-Soviet Central Asian culture had always been a theme in the region’s engagement with Socialist Realism, its expression changed over time. 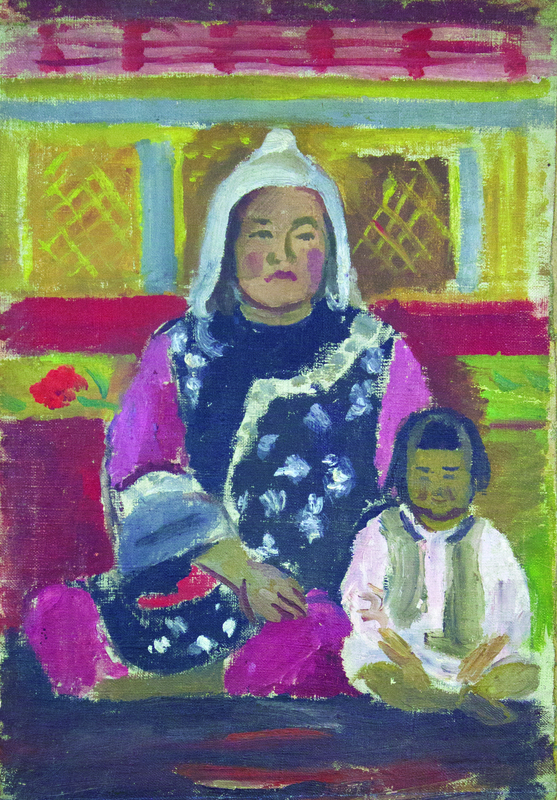 In the first four decades after the Bolshevik Revolution, nostalgia for Central Asia’s pre-Soviet life and exotic culture was pregnant in many of the works of art produced by artists from outside the region who had settled there. Some of these artists were even born in the region as children of settlers from elsewhere in the Russian Empire during the late 19th and early 20th centuries. 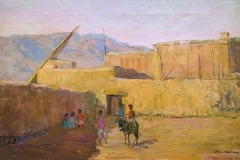 As a result, they had a strong appreciation of the region’s cultural uniqueness, but they also brought an outsider’s perspective and European style to their work that created a unique Orientalist vision, which was both reminiscent of that from Western Europe and yet distinctly founded in the context of Russian imperialism. Their Orientalist attraction to the region was expressed through Images of “noble natives” and their material culture—decorative art, woven carpets, yurts, and traditional clothing—as well as through romantic landscapes of the land in which they lived. 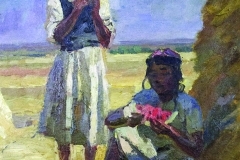 In general, the theme of nostalgia for pre-Soviet Central Asia was a constant throughout the region’s Socialist Realism. 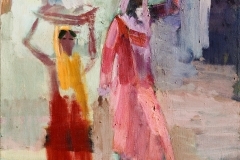 In the early years of Soviet power, it was a theme primarily explored by European artists who had made the region their home. It allowed such artists to escape the politicization of modern Soviet culture and to indulge in a fascination with the exotic. 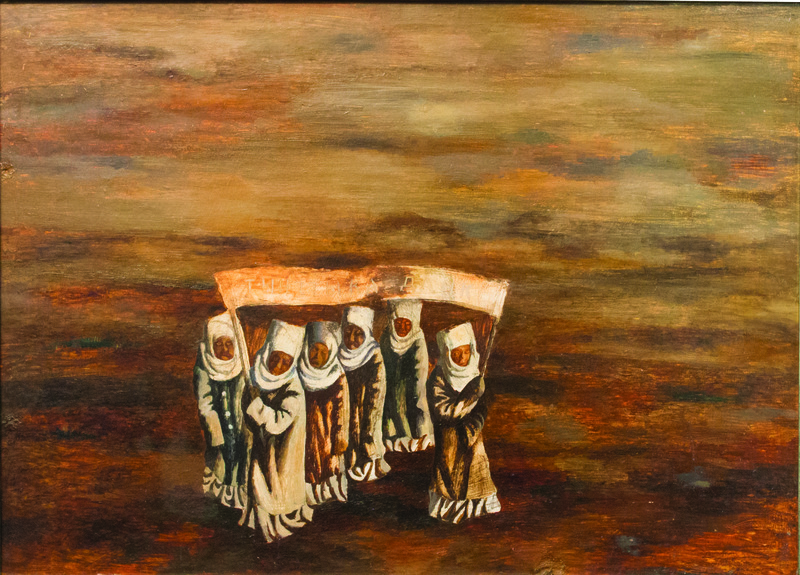 However, by the 1970s, this theme had become the domain of artists from the indigenous ethnic groups of the region. For these artists, it allowed them to explore their own heritage and to infuse it with mythic ideals. 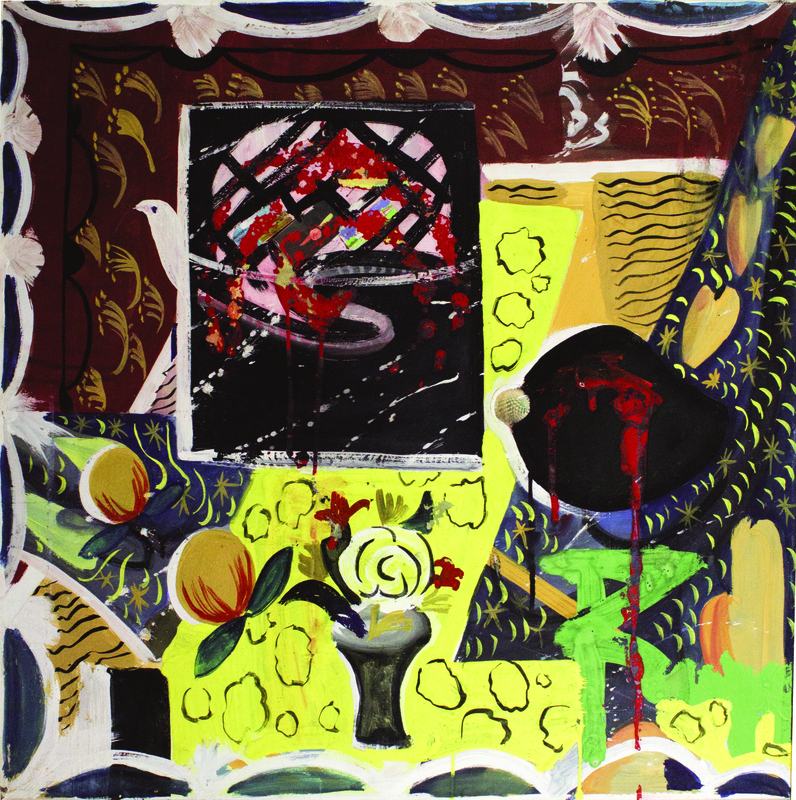 Although this art has elements of self-exoticization, it was also part of an evolving exploration of national identity in the region that continues to be a preoccupation with artists and citizens alike in the post-Soviet period. Varsham Yeremyan (1897–1963), an ethnic Armenian born in present-day disputed Nagorno-Karabakh. After studying in Moscow, he went to Samarkand in Uzbekistan to help promote the cultural ideas of the revolution. 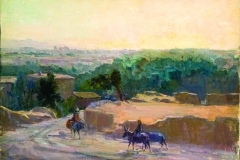 He was to stay in Uzbekistan for his entire career, and his artistic style shared much of the romantic appreciation for local culture seen in the works of Maleina and Chuikov, who was his close friend. Yeremyan’s Bazaar at Bibi Khanom (1945) reveals this Orientalist style. Gapar Aitiev (1912-1984). 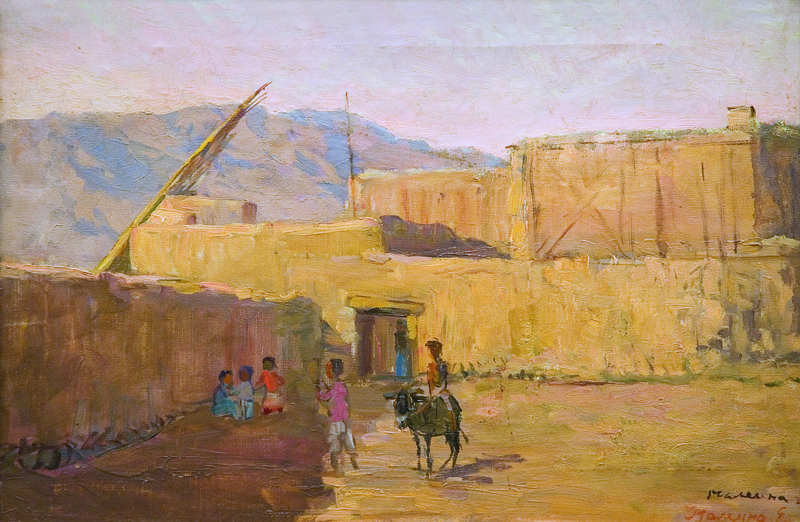 After studying art in Moscow and joining the Soviet army during World War II, Aitiev returned to Kyrgyzstan to begin a career as a painter. 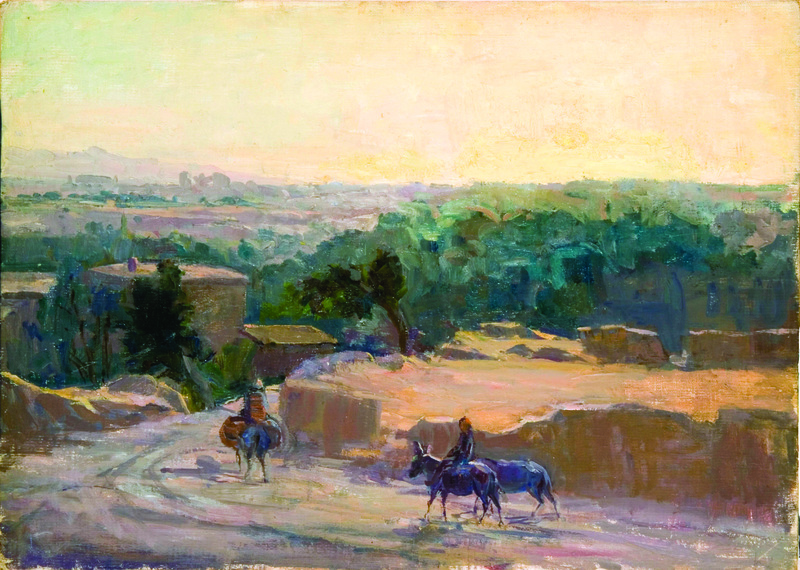 Many of his most famous pieces celebrated the beauty of Central Asia’s traditional culture. 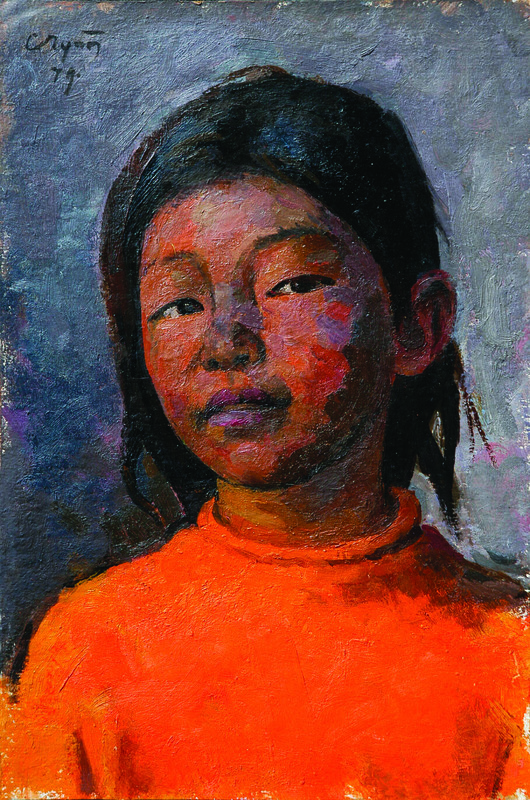 His oil painting Southern girl (1946) exemplifies this style by portraying a young woman from southern Kyrgyzstan braiding her hair in traditional style. Vladimir Butorin (1937-2005). Butorin was born in the Voronezh region of Russia, but later moved to Kyrgyzstan where he was a prolific book illustrator. 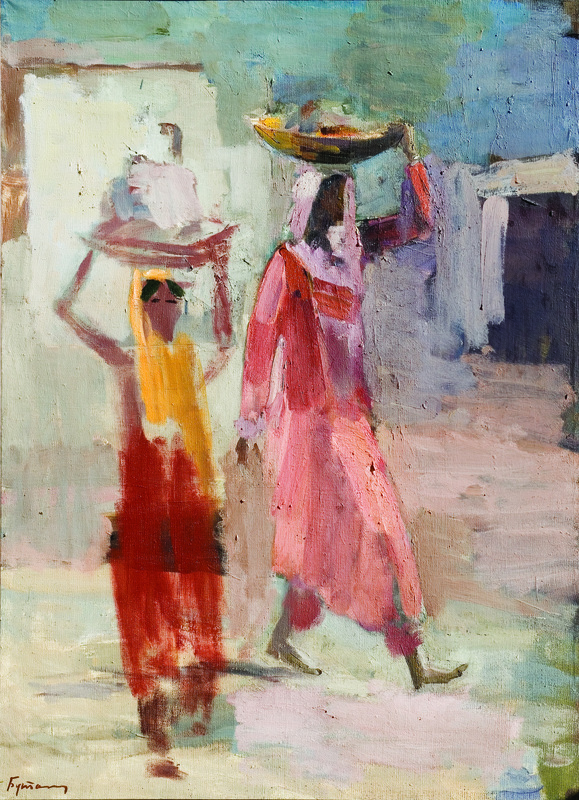 Women of the Orient (2002) is evocative of traditional Central Asian colors and is expressed through a beautifully executed impressionist style. 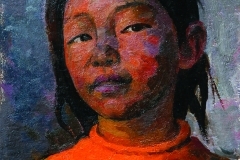 Satar Aitiev (1945-) is the son of Gapar Aitiev and is a rare example of a second generation ethnic Soviet Kyrgyz artist. Aitiev became part of a larger movement to blend Soviet modernist concepts with traditional cultural values and symbols. In Aitiev’s For World Peace! 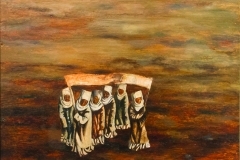 (1970s), he uses a well-worn Soviet trope of people marching with a banner, but he transforms the familiar Soviet demonstrators into abstract characters dressed in traditional Kyrgyz women’s clothing while he depicts nature abstractly, using a diffuse, improvisational brown hue evocative of the color of mountains. 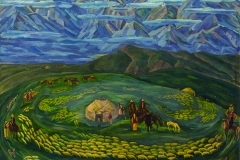 Kadyrzhan Turgunov (1950–1994) represents the cultural diversity of Central Asia’s indigenous population as a son of an Uzbek father and Tatar mother living in southern Kyrgyzstan. 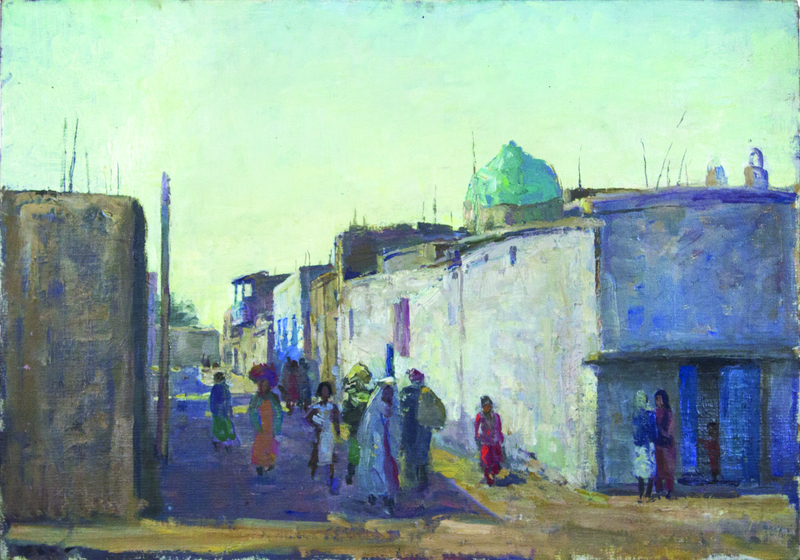 He was influenced by the work of Paul Cézanne, and by Fauvism, but retained a clearly independent style that evoked his Central Asian heritage. 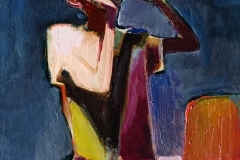 His paintings Oriental Beauty (1992) and The Poetess (1992) evoke the Orientalist tropes of female beauty and poetry, but in abstract forms with bright colors and decisive lines. 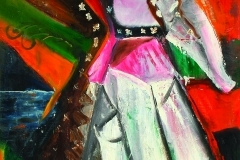 As such, while they share themes with realist paintings in the exhibition, such as Efremenko’s Dancer and Aitiev’s Southern Girl, they come from a completely different tradition. 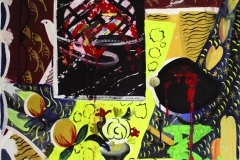 In his most recent work, Vicissitudes of Life (1992), Turgunov moved completely away from figurative subjects, transforming a still-life of everyday objects into an abstract interplay of colors and textures. 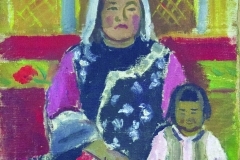 Bakhtiyar Tabiev (1940–1999), was born in the border town of Kuldja in the neighboring Xinjiang Uyghur Autonomous Region of China and emigrated with his parents to Soviet Kyrgyzstan in 1955. Tabiev’s work represents everyday life in Central Asia in stark, haunting, yet beautiful imagery accented by dark colors and sharp lines. 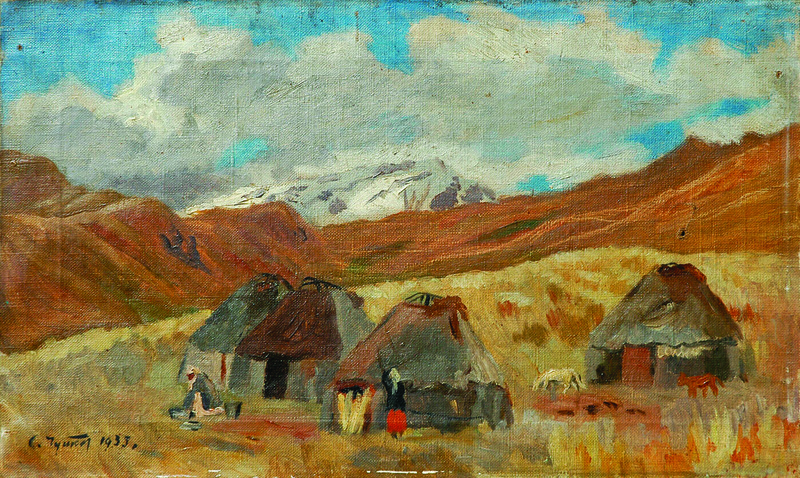 In his oil painting In the mountains of Naryn (1991), Tabiev provides an uncluttered landscape that evoke the simplicity of rural life. 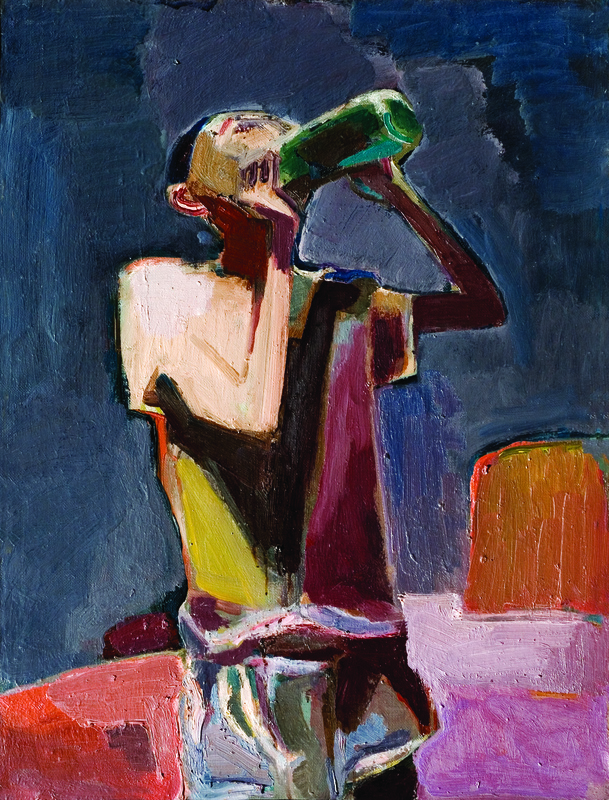 He presents a similar style in his oil painting The thirst (1992), which depicts a young gaunt boy chugging a bottle of water. 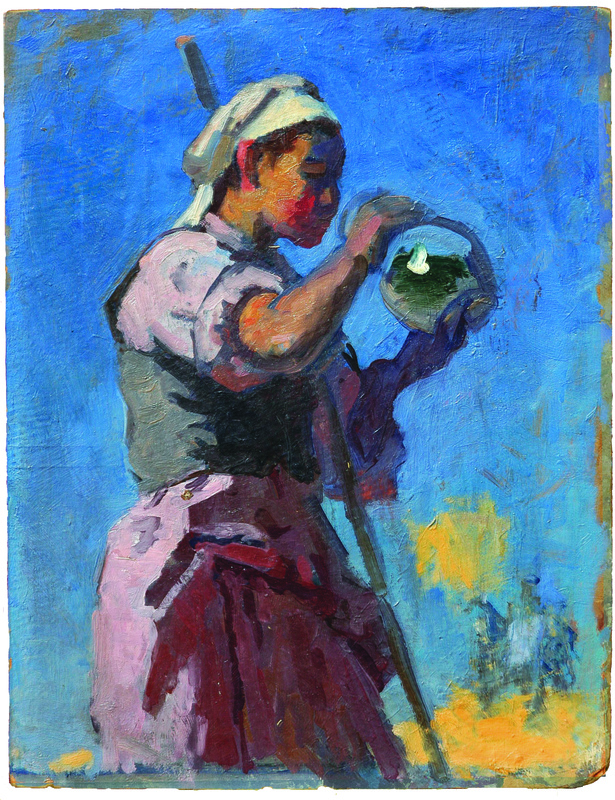 While the painting is simple in its composition, it captures the feeling of thirst one would imagine after working in the fields under a hot sun all day. Dzhambul Dzhumabaev (1946-2005) accents the region’s fantastical side. 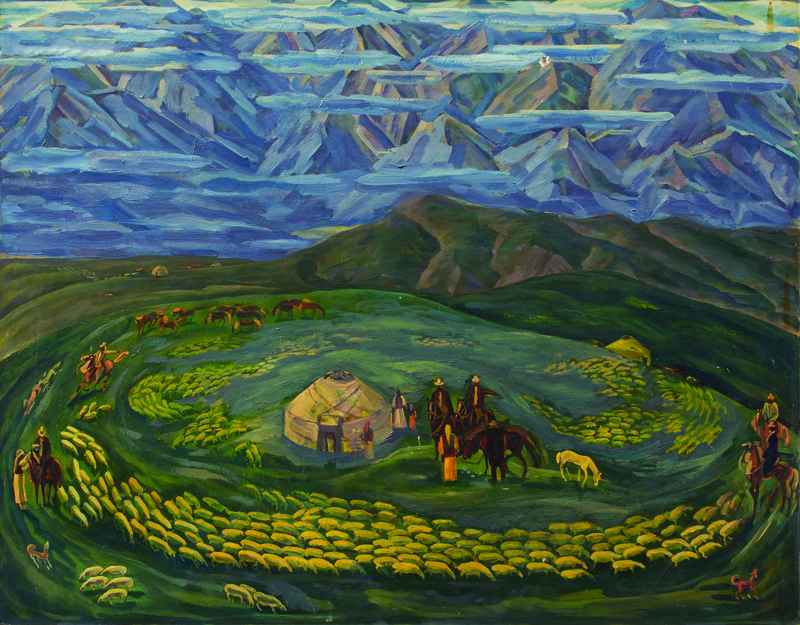 Originated from Osh in southern Kyrgyzstan, Dzhumabaev demonstrates his appreciation of the rich greenery of the region’s oases in his work. 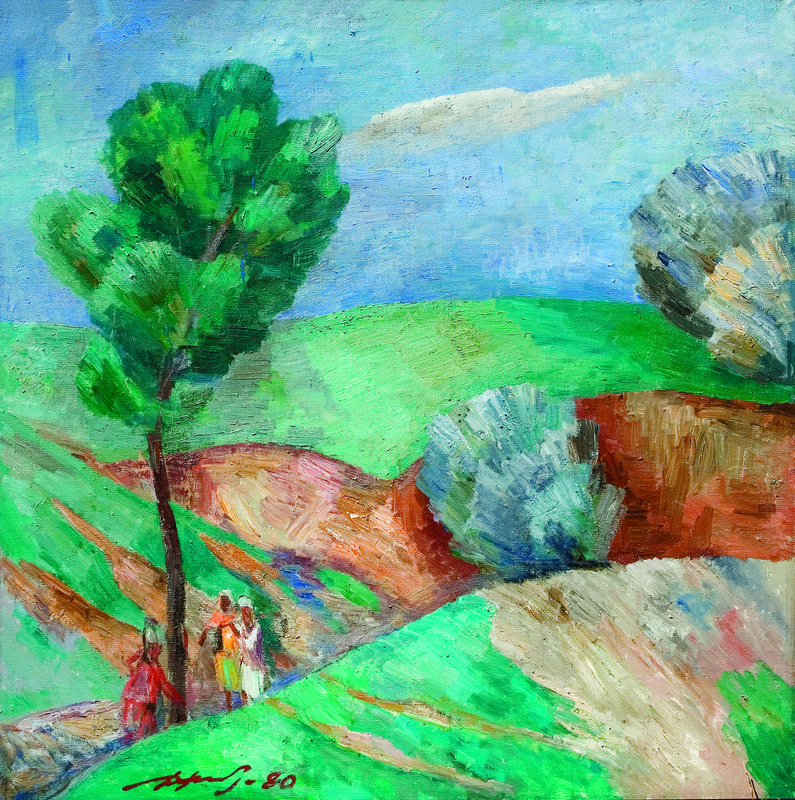 His oil painting The Spring (1980) captures this appreciation of the oasis’ green growth through rich and bright colors reminiscent of European impressionists.